The objective of SHARE is to enable an operational soil moisture monitoring service for the region of the Southern African Development Community (SADC). 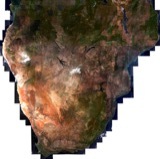 The objective of SHARE was to enable an operational soil moisture monitoring service for the region of the Southern African Development Community (SADC). With this service SHARE has addressed today's most severe obstacle in water resource management which is the lack of availability of reliable soil moisture information on a dynamic basis at a frequency of a week and less. The soil moisture information system is based on synergies of the ENVISAT ScanSAR Global Mode and the ERS-2 scatterometer products. The combination of both systems allows the resolution of temporal and spatial patterns in regional soil moisture dynamics. Derives a downscaling layer based on ENVISAT ASAR Global Mode data which will allow the interpretation of coarse resolution soil moisture information as provided by the ERS-2 scatterometer at 1 km resolution. 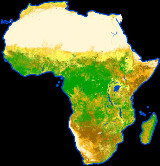 The long-term vision of SHARE is to supply soil moisture information for the entire African continent, at a resolution of 1 km, run by African partners, posted on the web, freely accessible to all.